Max Vitt (left) drove in the winning run while Alessio Azimipour (right) earned the win after striking out nine over four innings. Photo by Josh Belanger. 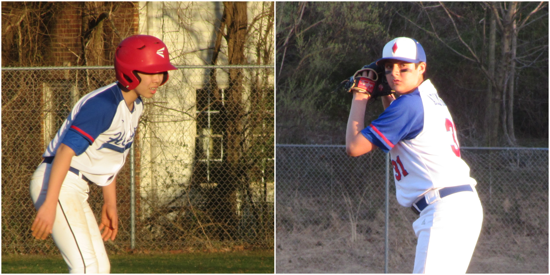 Max Vitt delivered in the clutch for the Diamond Heroes Payne 13u, driving in Ewan Highsmith to score the game-winning run in an 8-7 win over the Fairfax Royals Black 13u last night at Nike Park. Vitt did not miss the 3-0 fastball from left-handed reliever Harry Kepler and ripped a hard shot to the third baseman, who was not able to beat Highsmith with his throw to the plate. Vitt also drove in a pair of runs in the second inning with a triple to left-center. Heroes starter Alessio Azimipour struck out the side in the first inning, however allowed an unearned run that became a theme for his defense the rest of the game. The Heroes would commit four errors in the game, leading to four of the seven runs for the Royals. “I thought it was great because he stuck with it. We had some errors in the field and he didn’t let them get him down,” Heroes coach Steve Payne said. Azimipour kept his team in the ball game with nine strikeouts over four innings en route to the win. The right-hander would record his final strikeout with the go-ahead runner standing on third. Royals starter Chris Johnson was charged with seven runs and was relieved by Owen Fisher with two outs in the second. Fisher retired four of the first six batters he faced, but ran into trouble after he walked the first two batters in the bottom of the fourth. Knowing the fourth would be the last inning due to the time limit, the Royals turned to Kepler to keep the game tied. Vitt had other intentions and lifted the Heroes with a base hit. Highsmith and Zander Greene reached base all five times they came to the plate and scored four total runs for the Heroes. Mathew Downs also had a nice night at the plate, smashing two doubles to each side of the field. Despite all the unearned runs, the Royals still swung the bats well. Daniel Moir went 2-for-2 with a pair of runs and an RBI triple. Matthew Murphy and Andrew Lola also drove in runs for the Royals. The Heroes will be in action next against the Bradley Eagles on Sunday while the Royals will play in a doubleheader against the YBA Hustle on Saturday.